The Spaniards have the their "Running of the Bulls"… We've found the Austrian version "Running of the Cows with the clinging of the Bells!" 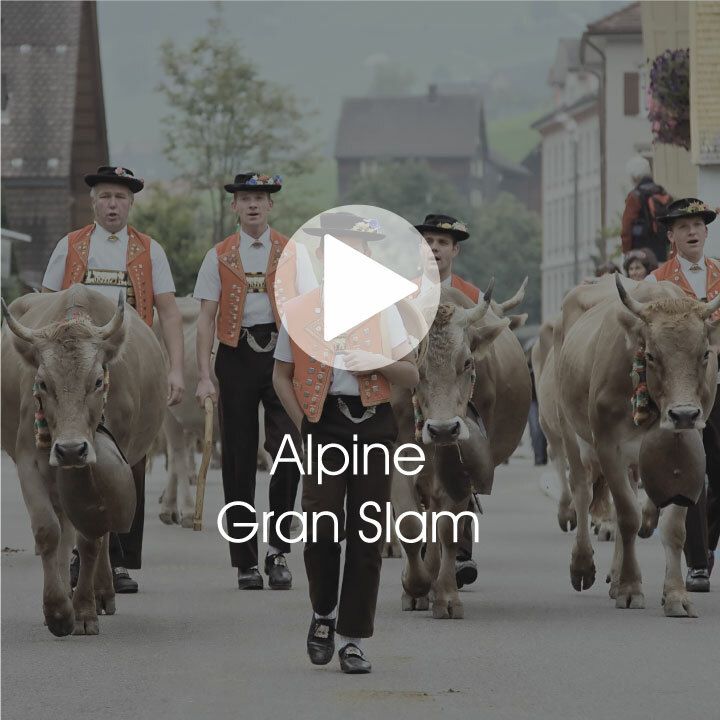 This year join RTT and guests from all over the world for a once in a lifetime event “Almabtrieb,” a ceremonial cattle drive and festival in the Tyrolean Alpine Region of Austria! Day 1: We arrive at our hotel in the midst of the Zillertal Valley. The evening offers you plenty of time to relax and enjoy the wellness area, jacuzzi or Kneipp-Grotto at the hotel, explore the town or enjoy dinner at local restaurant. Day 2: In the morning, wake to the distinct ringing of mountain bells and the breath-taking view of the alpine valley, ablaze in autumn splendor. After enjoying a generous Tyrolean breakfast, we set out to partake in The Homecoming of the cattle, a time-honored alpine tradition. The cattle that have been grazing on the high alpine pastures all summer, now return in a celebrated parade to the lower farmlands to winter over. The prized cattle are lovingly adorned in flowers, ribbons and embellished head dresses made of lush bouquets, holy figures and bells. The Homecoming is accompanied by the “Zillertaler - Almabtrieb” a colorful festival loaded with countless stalls showcasing all the regional specialties such as pine schnapps from local distilleriesfarmers wares, cheese, charcuterie and more. Enjoy samples, eat, drink and purchase your favorites to take home and share. Watch whip crackers at work and maybe get a lesson on how it’s done! Live Austrian folk music bands offer the perfect ambiance and the opportunity to join in the traditional dances and sway until it’s time return to our alpine hotel retreat where our dinnerawaits. Day 3: After a hearty Tyrolean breakfast, put on comfortable shoes and for a day of exploration where we take you to the breathtaking heights of 9750 ft. on one of the most scenic gondola rides in Austria. The Ahorn mountain Gondola takes us to the top of the Tyrolean Alpine Region, where the highest peaks will be laid out at our feet. The afternoon offers plenty of free time for you to explore this the peaks and views. From the Eagles View you can capture the breathtaking 360 degree view, follow leisure trail with its wellness points that will awaken all your senses, test your balance on the Sinnespfad (sensory path) or perhaps choose the Bird of Prey path at the Summit Station. Enjoy Zillertaler culinary delights in one of the traditional huts or the Panorama Restaurant. Our bus will be waiting for us late afternoon to take us back to our hotel for our scheduled dinner. Day 4: After a final Tyrolean breakfast it is time to check out of our hotel. Our trip to this region, famous for its dairy production, would not be complete without a visit to a typical Austrian Sennerei (Cheese farm)! Here we will see first-hand how the Tyrolean’s go about making their famous mountain cheese, milk and butter. After getting our share of tasty samples and perhaps some souvenir or two, we continue to on to beautiful city of Innsbruck! Here, your guide will take give an informative walking-tour of the down town area and point out must see highlights such as the Cog Rail Train to the Castle Hungerburg, the 3-story Swarovski Crystal store and the famous Church Hofkirche. With our alpine adventure at an end, we head north for the return trip to Germany. This tour includes longer periods of walking, some parts on moderate hills.